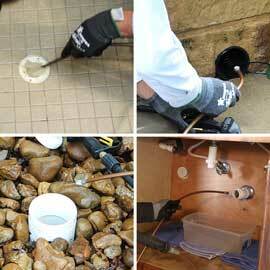 Cleans indoor lateral lines, main household sewer drains, and more. Scrub away grease, sanitary paper, food residue, hair, and other indoor clogs. 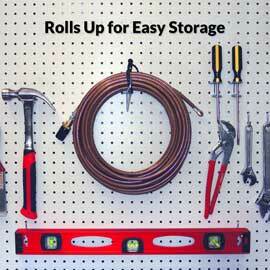 Includes a double-headed hose tie to keep your drain cleaner neatly coiled after use. 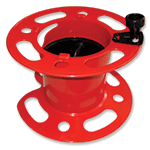 Item SJ-50-M (consists of a J-50-M drain cleaner with an M22 adapter installed, and your choice of electric adapter kit). Click this list of compatible brands before choosing the Adapter Kit AK-B. Check the special brands below to see if you require a different adapter. 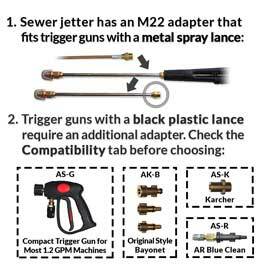 If your machine is not listed, compare these detailed adapter diagrams, or contact us. Shipping Weight (with standard Adapter Kit): 4.9 Lbs. 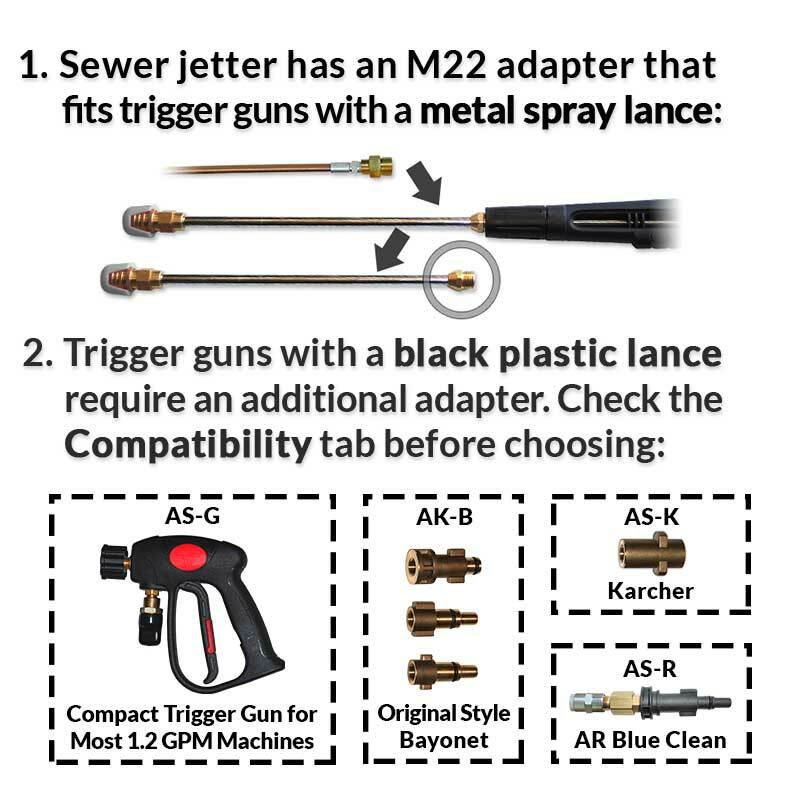 Note: the J-50-M drain cleaner in this set is also compatible with most gas machines rated up to 2.9 GPM when using the M22 adapter that comes installed. Awesome drain cleaner. First time using one of these. Couldn't be easier. It worked exactly like it should. What's nice about it is because the 3 back jets, it actually helps feed the hose through the pipes. I would recommended to anyone. I’ve had years of aggravation dealing with a recurring grease clog problem on the 2” line from my kitchen sink. I’ve fussed and fumed while struggling to force a 50’ wire plumbing snake into the 2” outside wall clean out, just a foot or so below the sink. It’s never been easy and once I do manage to get the snake around the down turn, it’s always an endurance contest between me and the clog(s) to see who lasts the longest. After all that, most of the time I only manage to break a hole through the grease clog that ultimately re-fills and re-clogs when I least expect it and have no desire to start the process again. After seeing ads for your product (and competitors’ products) for several years, this time—after I snaked again but knowing the job was only a “bandaid” for a serious ailment—I bit the bullet and ordered your 50’ hose and a special attachment for my small electric pressure washer. Still skeptical once it arrived, I was amazed how easy it was to connect and use. And my old struggle just to make the down turn at the wall clean out was gone with your hose and water-driven nozzle. Apparently my pipes were heavily encrusted with lots of very old, hard grease—which your product broke apart and flushed back out of the clean out. After a thorough back and forth cleaning, the water’s draining better than ever before. And this was so easy compared to my old snake method, I plan to re-jet twice a year just as a regular preventative maintenance item. Wish I had done this sooner!!! Thanks for a great product that delivered. Used the 50ft cleaner for our outside drains. Amazing results cleaning everything out quickly. Highly recommend this tool ... save a lot of plumber bills. 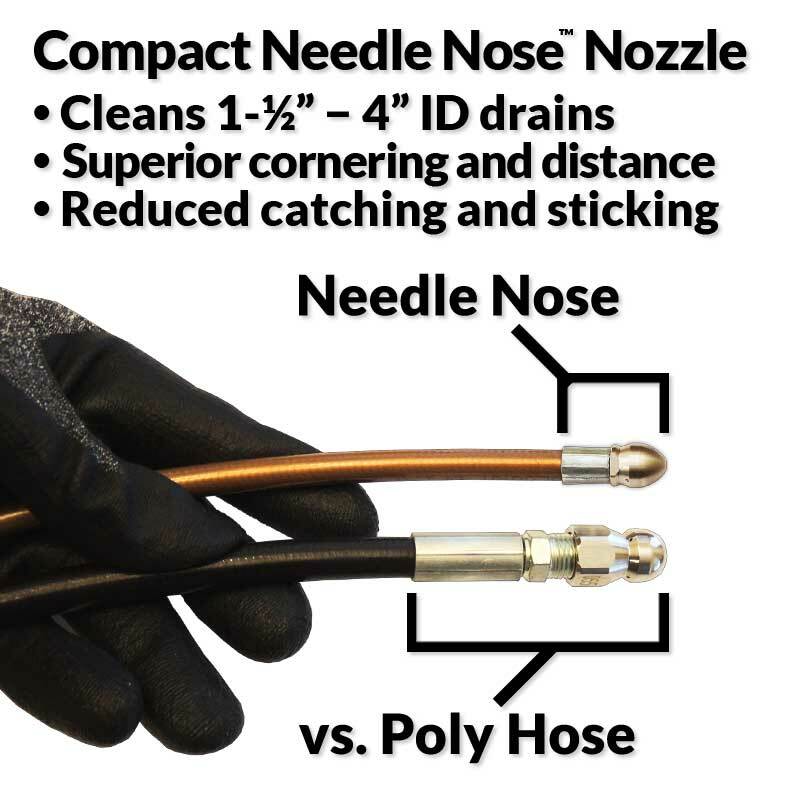 I ordered the 50' Needle Nose set to clean the line from our kitchen sink because of the soap and fat in the long, low-slope drain line that I had to clean out once before with a rotary snake. What a mess! The jet cleaner did a superb job on these PVC lines even with my 1650 psi electric washer. The nozzle pulls itself into the pipe just as described and leaves everything quite clean and clear. I had a little difficulty getting the hose fitting onto my old washer gun, but with a little convincing and a wrench, it did fit correctly. The only operating trouble I had was the nozzle not going past one of the laundry traps where there is another 90 right after the trap. I tried every thing in the help (pulsing, twisting) and even warm water to soften the line a bit, but it would still stop at the same point. That left a 8" section to the main partly uncleaned, but I can live with it. The main lines were very easy to clear from the cleanouts. I'm looking forward to trying this on the corrugated pipes below our downspouts when the weather gets warmer to flush out many years of roof debris. I've been quite pleased with what it has done so far. I had read many testimonials about the Clog Hog so I thought I’d give it a try. I had a very slow shower drain that I had been unable to clear. It took me some time but I removed all sorts of stuff (even a small plastic toy fish) from a 55 year old drain. I ran it the full 50’ length and now the drain is clear. It has definitely paid for itself in plumbing costs if I had a “pro” came out to do it. Thanks. Start by saying I own a kinetic water ram and several sized power augers, I had a basement bathroom floor drain that I tried everything on. A camera inspection showed construction debris for several feet restricting the flow along the bottom of the line. The bathroom was roughed in years ago but never finished, the stuff was dry and solid. The Clog Hog cleaned it in 20 minutes!!! Tried using my electric pressure washer (1.4 gal./min.) Not enough back pressure to push forward. Then went to gas powered (2.5 gal./min.) plenty of back pressure to pull the line tight. Excellent job!!! Dana, thank you for your comments. We'd expect your 1.4 GPM electric machine to be sufficient for cleaning indoor waste from a 1-1/2 to 4" ID drains, but for cleaning heavier outdoor debris a gas pressure washer like your 2.5 GPM machine is definitely recommended. You can find more details on our How Do I Unclog Yard Debris and Dirt tips page. 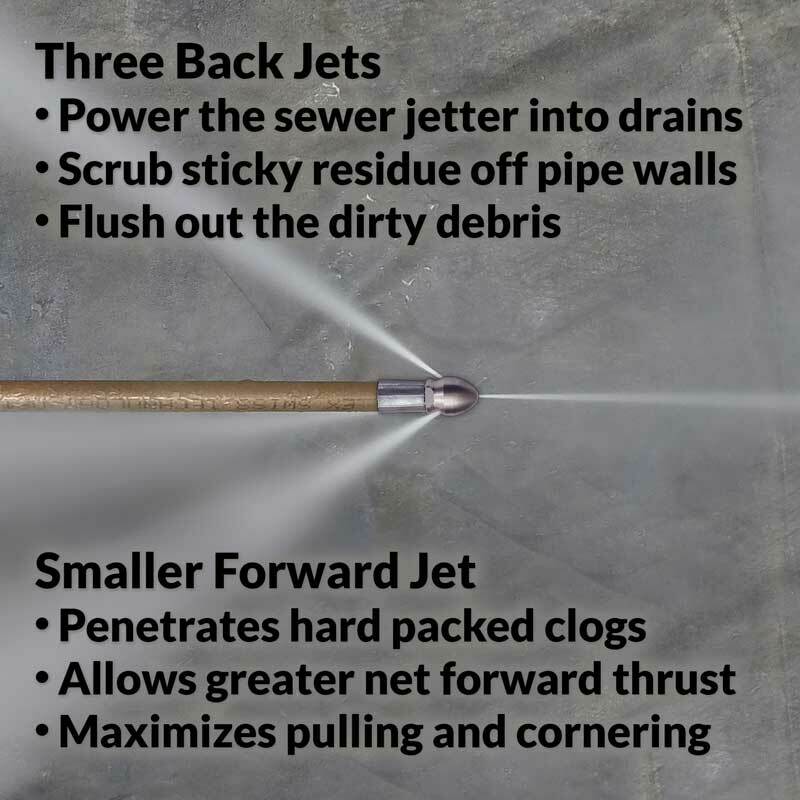 Fortunately the model J-50-M sewer jetter that's included in your Drain Cleaner Set is compatible not only with electric pressure washers rated up to 1.6 GPM, but also with most gas machines up to 2.9 GPM. I am a home owner. Very happy with this product, it worked very good, I used them every 6 months to clean my kitchen drain pipe 2" diameter, it went to 90 degree elbow with no problem, after cleaning water drain smooth and quickly. Thanks for engineering. After years of trying to clear a twelve foot drain line from the kitchen sink to the one of the larger main lines (both with a snake and plumbers with snakes), I researched different ways to sewer jet the clog. Local plumbers wanted around $700. Didn't feel comfortable trying to fashion my own hose from internet parts. 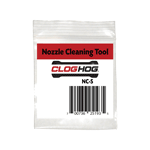 Read the Clog Hog reviews and ordered the 50 ft. Needle Nose Drain cleaner. Since the pipe I needed to clear was a two inch pipe and I needed to go around a couple of angles, this was a good choice. It arrived quickly and I hooked it up no problem using the adapter kit. At first when it encountered the clog it didn't jet right through it. I followed the instructions and backed it out and kept at it. It took about fifteen minutes to clean it out completely, but I kept going back and forth for another ten minutes to make sure. Forty years of grease gone. Also, I am a rockhound and have used that sink to wash off a number of rocks. Probably there was grease and rock pieces stuck together. I don't wash rocks in that sink anymore. I used an electric pressure washer. If I had a gas one, I bet the clog would have been gone in half the time or less. Drain has run great for months now! I had a question and they got right back to me. Good service. Thanks Clog Hog. We have a seven unit apartment building. We have had many problems with draining issues and have always attempted to try to use a traditional cable snake to unclog the drain. Sometimes the cable snake would work but majority of the time it would not or the occurrence of the back up wood happen again within one months time. We had chose to order the clock hog drain snake and sure enough it had unclogged the drain line and it has been eight months before another occurrence had happened. As I had said before using the traditional snake the occurrence of the clogged drain would happen within one month but I feel that the clog hog had clean the pipe along with unclogging the drain. Remember this is an apartment unit in with many tenants they have a tendency to throw oil or grease down the drain and even though they are not supposed to. But now what we do for the apartments is that we Clog Hog all the drains every three months just to avoid any build up and waiting for it an occurrence to happen. 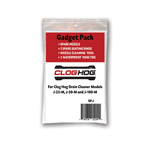 Thank you Clog Hog for the awesome product. Worked great would buy again! Nice design and easy to use. 50 Ft Needle Nose Drain Cleaner Set, is a wonderful product, I was able to clear my kitchen sink drain, with no problem. Works great and made my pressure washer even more flexible. 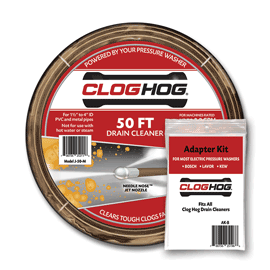 My first impression was that the Clog Hog is very well made. I did notice that it lacked markings to help identify how deep a blockage is in the drain. I used colored electrical tape every foot for this purpose. 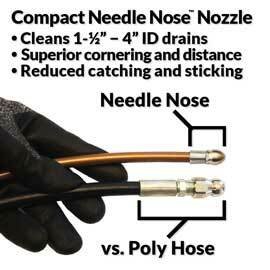 In my expedience the needle nose version works well with both electric and gas pressure washers. I first used my electric washer and could clear about 12 ft. into the drain. I had previously been told of this by Clog Hog support. After seeing how much debris the clog hog was removing, I decided to borrow a gas washer and finish the job. With the gas washer I was able to clean the entire 50’ of main drain. A tremendous amount of scale and other debris was removed. The drain is now working wonderfully. An adapter is included to use it with the electric washer. I decided to purchase an additional adapter from the hardware store and connected it to the provided adapter. Using this combination I can go from electric to gas washers without changing the Clog Hog connection. This worked great and also allows me to use my electric pressure washer with other standard connection accessories. The addition of incremental markings on the cable would earn this great product the 5th star. Willie, thank you for your comments. The sewer jetter hose marking materials that we've tested - including inks, shrink tubing and tapes - all eventually wear, leading to potential problems should users rely on the markings to determine when to shut off the high pressure water. If you need a temporary marking to judge cleaning distance, you can attach a thin strip of bright electrical tape, though it's often simpler to check the length of remaining hose that's outside the pipe. I had a frozen sewer line and this cut thru it with ease. I highly recommend using this tool. 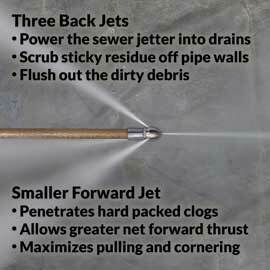 It worked great with my electric pressure washer and plan to use it anytime I have slow draining or grease filled lines and gutter or yard drain pipes. I have struggled for years with a drain under my basement floor. I had to snake it 2-3 times a year. The clog hog worked beautifully based on the amount of gunk that came out. So far looking good. I could have used an extra set of hands to keep from bending the clog hog hose. After attempting to clear our kitchen drain with no less than 4 different drain tools, including another brand of drain jetter, I started figuring out another plan. With all my efforts resulting in no measurable success, I started calling plumbing experts. After getting 3 different quotes, I realized I could buy the 50 ft Clog Hog for a little more than one service call. I'm so happy I did. After cleaning all our drains, I saved money already. Turns out our drains have too sharp of corners for most jetters, but Clog Hog went through perfectly. And now every drain on our house works flawless! Thank you for making a great product! Product worked as described. Quality hose and well machined nozzle. A few more dollars than some other competing products but worth it. Cleared a frozen septic line, worked great. This product is amazing! Living in an older 1970’s house means drain issues. 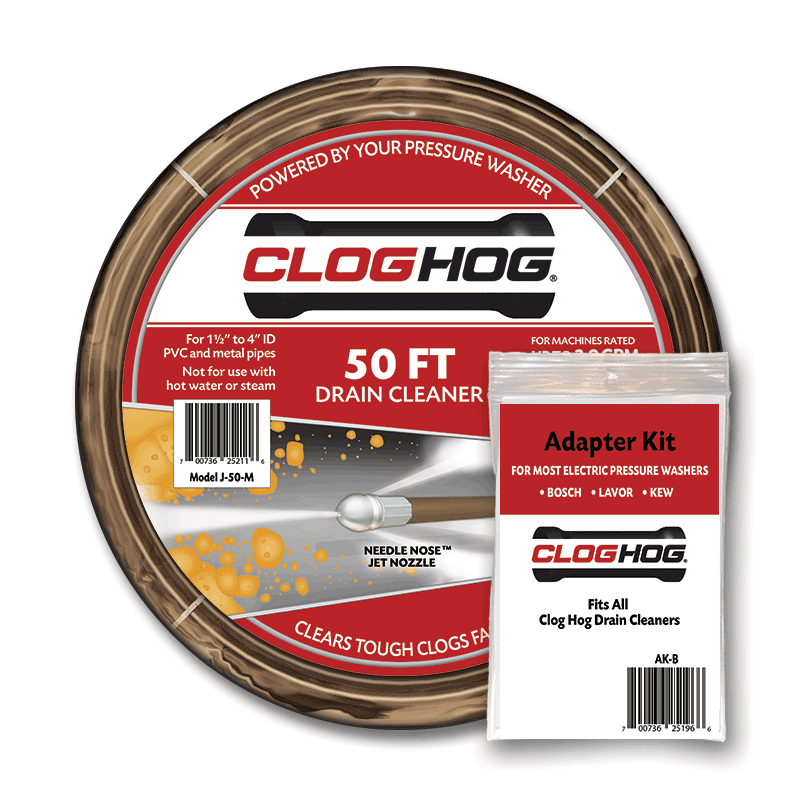 Using the clog hog gives me piece of mind that those old pipes are clear and clean and has saved me money not having to call a plumber! I highly recommend it! 1. The staff were helpful in setting me up with correct adapter for the tool. 2. It cleared up the clog in my exterior 4" drain even though it was a small electric washer I was using. 3. Couldn't mail it to Canada, so I'm taking off one star. 4. Having multiple adapters means it will likely work with the next pressure washer, even if it is a different model. Ron, thank you for your comments. 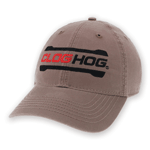 Clog Hog does offer USPS Priority Mail International shipping to Canada. The international shipping fees charged when you checkout are the real-time rates quoted by the US Postal Service. I used this to clean my drain tiles in my basement and it worked perfectly. Rotor rooter wanted $600 to do it and after searching the net I found this and it hooked up to my pressure washer perfectly. Customer service is great as well. They will help you make sure you have the correct adapter for your pressure washer. Great product for a do it yourselfer for sure! Used to clean house drains and very long run of backyard to front drains. I have a large lot with multiple drains around pool and planters. They often get sediment from cleaning patio and also roots. I used it with my power washer and cleaned all drain lines in yard. worked well. Also used it in clean out that goes to kitchen and upstairs which can build up with grease and soap. The only one that would make the sharp turn in clean out. Seems to have cleared these as well. Works better than advertised... Simple to use.. I used it to clean out a clog in the main house drain... worked it from the street end cleanout up toward the house.. so was actually able to "see" the results down below!! Found there was also a lot of sand settled in the bottom of the pipe ( I live near the shore)that it made short work of!! Feel like it is well made also..